Leading Manufacturer of cable joint kit accessories from Thane. We are highly appreciated worldwide for exporting Filtration Kit Accessories which comprise of an oil free vacuum pump. 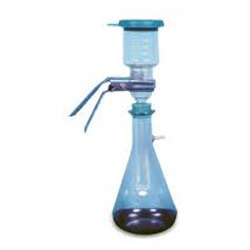 This filtration kit contains a vessel, a flask and a holding clamp. It is free from any defects and is highly durable. It is manufactured using supreme quality raw materials and is fire proof. The raw materials are obtained from trusted vendors. Looking for Cable Joint Kit Accessories ?